Ashok K.tripathi from Thana, B.Sc Graduate. Working for : Sequent Scientific Ltd. Currently working as NA at Sequent Scientific Ltd.
28 YRS EXP.IN QUALIT.. BULK DRUGS DYES AND CHEMICALS. are one of expert skill area's of Ashok K.tripathi . 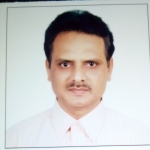 Ashok K.tripathi is working in Quality/Process Control industry.